World literature has become a subject of lively – sometimes heated – debate in recent years, both as a body of texts and as “a problem,” as Franco Moretti remarked in his influential pair of conjectural articles (Moretti 2000, 2003). Much of the discussion since then has focused on issues of scale and the challenges of incorporating a meaningful range of the world’s literatures in our work, whether when teaching a sophomore-level survey course or in mapping the global spread of the novel. The perspective on world literature as a vast landscape stretching out into the far distance has been widely shared both by those who praise the expansion to a planetary scale as offering a way to move beyond Eurocentrism and all sorts of regional parochialism, and by those who criticize literary globalists (planiterati?) for cultural imperialism or for sacrificing the linguistic rigor and cultural depth traditionally emphasized by more circumscribed comparative literary studies. Certainly there have been good reasons for the global approaches to world literature pursued by various of us during the past decade, as well as principled grounds for disputing those approaches. But world literature is almost always experienced by readers within the national context in which they live, and more particularly within the national market in which books are published, reviewed, and assigned in classes. In this respect, we can find a figure/ground reversal, whereby it is the nation that frames most concrete experiences of world literature, at least as much as it is world literature that frames any national canon. My personal hope for the coming decade is that we will look more deeply into the presence of the world within the nation, even as we continue to develop further our exploration of national traditions within the wider world. Such an emphasis doesn’t mean returning to the crypto-nationalism of much nineteenth-century comparative literature. The national literary traditions were never as self-contained, after all, as nationalistic literary histories have often supposed. Yet even our comparative literature departments often carry on the Herderian assumptions deeply engrained in many national literature departments: that the essence of a nation is carried by its national language, embodied in its highest form by the masterpieces of its national literature. The presence of minority or foreign languages within almost all national cultures has often been studied only minimally if at all. Until recently, American poets who wrote in Spanish were rarely if ever included in survey courses or anthologies of American literature. In England, Irish and Welsh were similarly neglected by scholars of English literature, and for many years were actually suppressed in schools. Counter-canonical and contestatory works are increasingly welcome in literary studies, but rarely in ways that disturb the paradigm of the national language, at most allowing for a very limited subset of dominant national languages. Spanish is at least now in play in American studies, but it is a rare Americanist who learns Navajo or Yiddish. Few scholars of Israeli literature learn Arabic, and few students of Indian literature go beyond Bengali, English, and Hindi to work in Gujarati or Malayalam unless they have a heritage connection to one of those languages. Bilingual writers are often seen primarily through their work in whichever language is dominant in a particular setting. Even in the case of a major canonical writer such as Milton, only his English-language works are commonly studied: no survey anthology of English literature that I know of includes any of Milton’s Latin poetry. Milton was fluent in Latin and proud of his poetic ability in the language of his epic forebear Virgil, but we take it for granted that his Latin poems aren’t worth our while. This is a judgment that most of us have made without ever having read any of them. Similarly, in India the great nineteenth-century poet Mirza Ghalib is beloved as a writer of Urdu ghazals and ignored as a Persian poet – even though Ghalib himself preferred his Persian ghazals to his Urdu ones. In Iran, conversely, he is honored purely as a Persian poet. Along with understanding the importance of alternatives to the “national language,” we need to give greater weight to translated works, not only as foreign influences from which we can plot the distinctiveness of our great national writers, but also in many cases as works that become integral parts of the literary culture into which they are translated. For present purposes, a short story by Julio Cortázar can provide an economical case in point. Latin Americanists rightly consider him as one of the great modern Argentine writers, and on a broad transnational scale he can be studied as a leading exemplar of global postmodernism. Here, though, I’d like to consider how these two aspects come together in a very particular time and place: Paris in the 1950s. And more specifically: in the 5ème Arrondissement, in the spring of 1951, in an exhibition hall of the Jardin des Plantes. This was the time and place in which Cortázar conceived one of his breakthrough fictions, the enigmatic short story “Axolotl.” What I hope to show is that a great deal of the world is present within the few pages of this story, and that both Cortázar’s Argentine identity and his worldliness can best be understood by close attention to the presence of the wider world within a small aquarium standing in a Parisian exhibit hall. Rayuela . . . est sans doute l'un des plus beaux hommages rendus par un Argentin à la capitale française. . . . . Inutile néanmoins de chercher une plaque de rue à son nom – excepté une à l'un de ses domiciles . . . . La Mairie de Paris semble ignorer combien de lecteurs de Rayuela sillonnent la ville avec en tête une carte du tendre faite des itinéraires parcourus par ses personnages. And it isn’t only the écrivain who has been naturalisé: Rayuela here appears in its French incarnation. We may wonder just how many tourists really come to Paris, like some belated Hispanic Emma Bovarys, seeking to realize the literary map in their heads; nor is it so clear that Rayuela’s motley crew of low-life types necessarily offer such a beau hommage to their adoptive city. Yet though Paris is only one of the transatlantic poles of Cortázar’s hopscotching narrative, the Parisian setting is central to "Axolotl." Not a tourist but a resident of Paris, the narrator loves to bike over to the Jardin des Plantes to commune with the lions and panthers kept at the garden’s Menageries. The setting is hardly random: like its counterparts in such imperial capitals as London and Madrid, as the Jardin des Plantes is a testimony to the metropole’s acquisitive passion for exotica, often including artifacts of "primitive" societies as well as plants and animals brought from distant lands. Here, the Cortázar-like narrator finds one day that the lions are gloomy and his favorite panther is asleep. On a whim, he heads into the aquarium building, where he becomes transfixed by the unwavering gaze of a tiny axolotl, a Mexican species of salamander. Returning repeatedly to commune with the "Aztec" axolotl, by the story’s end the narrator has become one with the little creature, trapped within the aquarium. In the story’s final lines, either the narrator or the axolotl consoles himself that “he” who is now outside may one day write "all this about axolotls" ("todo esto sobre los axolotl"). “Axolotl” is undoubtedly a work of Argentine literature: written in Spanish, it was published in Buenos Aires by Victoria Ocampo in her influential journal Sur. Yet it is equally a regional work of Latin American literature, as Cortázar chooses a Mexican creature as his narrator’s silent interlocutor and shadow self. In this respect, his experience can be compared to that of James Baldwin during the same period. As Baldwin recounts in his 1950 essay “Encounter on the Seine: Black Meets Brown,” he had fled America for Paris, disgusted with American racism and homophobia, and in Paris he encountered actual Africans for the first time. He discovered that they didn’t see him as their soul mate but as an American, and he began to realize just how American he was. So too Cortázar’s narrative stand-in discovers his Latin American identity while in Paris. Cortázar’s cannibalistic axolotl represents a severely ironized reworking of Rilke, whose majestic panther is no longer available to writers in a postmodern age: pointedly, Cortázar falls back on visiting the axlotl because “mi pantera dormía.” The axolotl is less majestic than Rilke’s panther, but also more uncanny, even more dangerous than the wild beast. “Usted se los come con los ojos” (“They eat you with their eyes”), as the guard in the aquarium remarks, and there’s no escape from the axolotl’s cannibalistic gaze: his eyes are lidless. Has the writer from the periphery been consumed by the greater force of European world literature? Such an understanding of the narrator’s metamorphosis, the narrator suggests, would be too easy: “Parecía fácil, casi obvio, caer en la mitología. Empecé viendo en los axolotl una metamorfosis que no conseguía anular una misteriosa humanidad” (“It would seem easy, almost obvious, to fall into mythology. I began seeing in the axolotls a metamorphosis which did not succeed in revoking a mysterious humanity”). If it would be too easy to be consumed by Ovid and Rilke, or conversely to absorb and merely rewrite their works, in the mode of Oswald de Andrade’s 1928 “Manifesto Antropófago,” who might be a worthier secret sharer for Cortázar’s narrator? 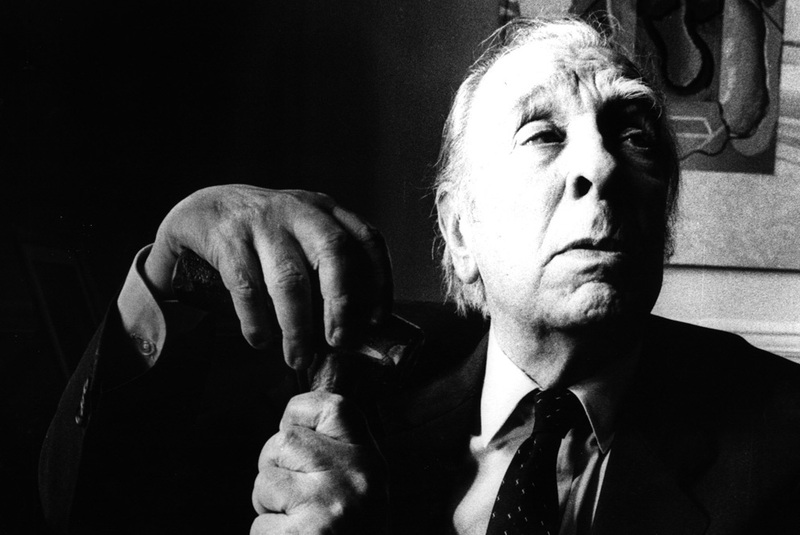 The question of a too easy rewriting of a European predecessor is the central issue of another breakthrough Argentine story, published a dozen years before “Axolotl”: Jorge Luis Borges’ “Pierre Menard, autor del Quijote,” the first of Borges’ great ficciones. In seeking to rewrite Cervantes for his own era, Menard famously begins with a method described as “relativamente sencillo”: to convert to Catholicism, fight the Moors, become fluent in sixteenth-century Castilian, forget the intervening centuries of European history, and in short, “ser Miguel de Cervantes”: to be Miguel de Cervantes. He discards this plan, however, as too easy (“pero lo descartó por fácil”), opting instead for the more challenging attempt to rewrite the Quixote while remaining himself. So too Cortázar forgets neither himself nor the history of European literature that he inscribes within his text. Instead of simply trying to rewrite Rilke, he mobilizes the European tradition in service of the struggle to free himself from the patron to whom he owed the greatest artistic and practical debts: Borges himself. As the story proceeds, the enigmatic axolotls start to sound notably Borgesian: “Oscuramente me pareció comprender su voluntad secreta, abolir el espacio y el tiempo con una inmovilidad indiferente” (“Obscurely I seemed to understand their secret will, to abolish space and time with an indifferent immobility”). The axolotls transfix him with a gaze strikingly described as blind: “Sus ojos, sobre todo, me obsesionaban…. Su mirada ciega, el diminuto disco de oro inexpresivo y sin embargo terriblemente lúcido, me penetraba como un mensaje….” (“Above all else, their eyes obsessed me. . . . Their blind gaze, the diminutive gold disc without expression and nonetheless terribly shining, went through me like a message”). Cortázar wrote “Axolotl” in 1951, shortly after exiling himself from Perón’s Argentina and settling in Paris. In 1949, after years of writing without publishing, not wanting to appear before the public until he’d found his own voice, he had finally had his first mature work published: a closet drama entitled Los Reyes, a meditation on the character of the Minotaur in the Cretan labyrinth. The mentor who had given this work to the world was none other than Borges, who published it in a Buenos Aires journal. In the same year, Borges also published his collection El Aleph, which included his own meditation on the Minotaur’s labyrinth, “La casa de Asterión,” first published in magazine form in 1947. Taken together, the multiplying reversals between consumer and consumed – Borges and Cortázar, narrator and axolotl, Kafka and Rilke, Paris and Buenos Aires – play out the shifting figure/ground reversals of the world and the nation that we can explore through the study of world literature in its local metamorphoses. Far from having to choose between the nation and the world, or between close and distant reading, comparatists have the opportunity today to look freshly at the intimate interanimation of these seemingly opposed terms. The world in a grain of sand; or in an aquarium, in the Jardin des Plantes, in the spring of 1951. "Les cinquante ans de « Marelle », livre culte de l’Argentin Julio Cortazar." Le Monde 10 Mai 2013. Accessed 18 March 2014 via http://america-latina.blog.lemonde.fr/2013/05/10/les-cinquante-ans-de-marelle-livre-culte-de-largentin-julio-cortazar/. Text from: http://www.literatura.us/cortazar/axolotl.html. In print in Final del Juego (Elche: Punto de Lectura, 2009), 161-68. Translation by Paul Blackburn as posted on http://pinpointing.wordpress.com/2007/05/02/axolotl/, from Blow-Up: and Other Stories (New York: Pantheon, 1985), accessed 24 March 2014. James Baldwin, “Encounter on the Seine: Black Meets Brown.” In Collected Essays (New York: Library of America, 1998), 85-90. Text from: http://www.textlog.de/6670.html; uncredited translation from: http://www.poemhunter.com/poem/the-panther . Text from: http://palabravirtual.com/index.php?ir=ver_voz1.php&wid=725&p=Jorge%20Luis%20Borges&t=Borges%20y%20yo, which includes a reading by Borges himself. A past president of ACLA, David Damrosch is Ernest Bernbaum Professor of Comparative Literature at Harvard University. His books include What Is World Literature? (2003), The Buried Book: The Loss and Rediscovery of the Great Epic of Gilgamesh (2007), and How to Read World Literature (2009). He is the founding general editor of the six-volume Longman anthologies of British literature and of world literature, co-editor of The Princeton Sourcebook in Comparative Literature (2009) and editor of Teaching World Literature (MLA, 2009) and of World Literature in Theory (Blackwell, 2014), and is the director of the Institute for World Literature (www.iwl.fas.harvard.edu ).